A massive thank you to all of you who left such wonderful comments on my Colour Block Quilt, which was featured as part of February Quilting Month over at the Sew Mama Sew Blog. This was particularly exciting for me because I’m quite a sporadic quilter and I had made this two years ago. The idea was spawned over three years ago. As you can see, I like to have things on the slow burner! 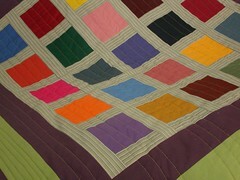 More pics of the quilt here on Flickr and my original post with all the details here. Go and check out all the other lovely people being featured this month.